These days it can feel like there is a curated playlist for virtually every day of the week, holiday on the calendar, and potential party/date/random spontaneous occasion humanity can dream up. What about live performance though? Genre-minded festivals help fill this gap and then, of course, single shows typically look to pair bands based on similar or transitionally appealing styles in order to draw and then retain as much of an audience as possible. Planet of Sound Promotions runs its practices in much this same fashion however, the Long Island based group also likes to stretch the idea of thematic programming with single night events that are planned out to feel like a burst of festival-level energy packed in a one day occurrence. 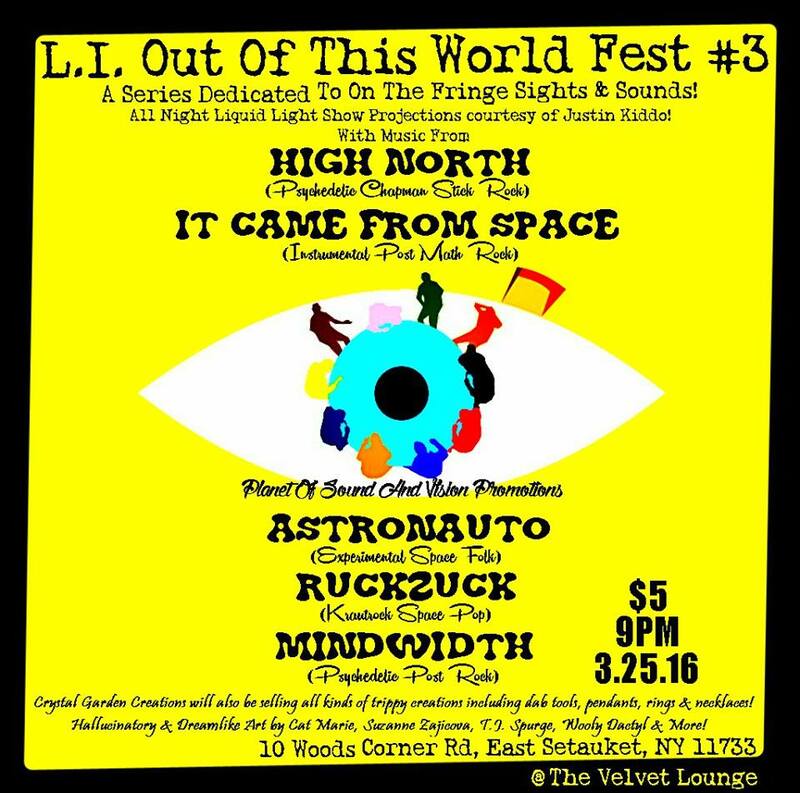 In the case of their latest such endeavor, for the upcoming Long Island Out of This World Fest, Founder Maxwell Peters has brought together five bands who share not only base genre commonalities but also an overarching interest in specifically channeling the qualities of space and its abstract state of being, through their respective works. Additionally, just as music festivals offer an experience with more than just sound, “Out of This World” will also be hosting crystal jewelry by Crystal Garden Creations and custom artwork by artists from around the Long Island area thanks to sibling creative promotional group, Planet of Vision Promotions. The event is a great combination of macro and hyper focused thinking and given the high competition for fans’ free time – whether online or in calculating their weekends – injecting a modicum of less conventional perspective into an otherwise common musical occurrence is a smart way to make something local not only feel cooler on the surface but to stand out despite limited appeal due to geographical reach. Full event information, as well as tracks and social links to each band, are below. Connect with Maxwell Peters and Planet of Sound Promotions through the official Facebook page. Connect with Planet of Vision Promotions through its official Facebook page. PledgeMusic acquires Set.fm and NoiseTrade: The next superpower in artist driven music tech?